Accounting Degree from the University of Alaska Southeast and Marketing degree from Montana State University. What brought you to Alaska? I grew up in Butte, Montana and attended college in Bozeman, Montana. My boyfriend’s (now husband) father was the president of Sheldon Jackson College, so we would come up during the summers to work in Sitka. After college we moved to Juneau for “just one more summer” and never left. That was 24 years ago. I didn’t pick my accounting career, I just fell into it. My husband and I started a fly fishing business, I saw the need to learn how to manage the books and taxes of our business to save money of hiring an accountant. I was also working for a local conservation non-profit as their office manager and starting doing the accounting tasks. This prompted me to go back to school part-time at UAS Juneau to get my accounting degree. Diversity of my job and my coworkers! I never know what I’ll be working on each day. My job varies from accounting tasks to making decisions about our licensing system to encouraging cross training amongst my staff. Making changes happen. When I see something that needs to be fixed or updated, I like to take action. I’ve come to realize that change takes a lot longer to happen in state government than in private business and in order to make a change, communication is key! Three years ago, a group of us were successful in getting a recycling program up and running successfully at the headquarters building. We used some creative ideas to change employee’s habits and embrace recycling at work, and hopefully at home. Tell us something about your life outside of work - or what drives you as a person. When I decided to return to state service, Fish and Game was the only department I was interested in working at as I love the outdoors, fishing and hunting. 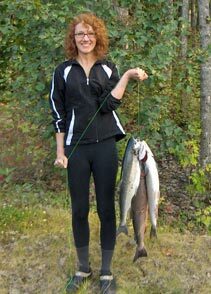 I believe in Fish and Game’s mission and hope to contribute to conserving our wild resources—yes even as an accountant! My two teenage daughters keep me busy with their sporting events and teenage activities. I love winter activities like skate skiing and sunny downhill days at Eaglecrest. My favorite sport is hockey and I’ve been playing since Juneau opened up their first ice rink nine years ago. I also play on the same volleyball team for the past 20 years. While we may be a bit slower, we can occasionally beat some of the younger teams. Graduated honors from high school. I have a broad and varied background from telemarketing, to retail jewelry sales, to real estate. Customer Service is in my blood. What brought you to Alaska or where did you grow up in Alaska? I fell in love with Alaska when I was 16 on a trip visiting friends and was finally able to move up from Washington 10 years later in 1994. I worked for several companies around Anchorage before I eventually found a landing spot with Fish & Game in July of 2000. I was a new parent and wanted somewhere I could build a career and enjoy the work I did. The diversity of my position really intrigued me and I have always enjoyed helping others. My job has evolved into a great position where I have a variety of administrative responsibilities, as well as helping oversee the day to day running of the Anchorage buildings. I am able to work with all the divisions and offices in our region. The variety of tasks I am responsible for and working with building staff – no two days are the same! Trying to accommodate everyone and make them happy. With approximately 270 staff in 2 buildings that is a daunting task. Outside of work I enjoy fishing and camping with my family and friends. Being able to relax in the great Alaskan outdoors is awe inspiring. It reminds me that we are just one small part to something much bigger. At home I enjoy cooking and reading and relaxing with my family.